Coat parchment paper or the dull dull side of freezer paper with hair gel, let dry and add design with Crayola washable markers or paint. Apply design to dry hair with a flatiron. Set design with hairspray. 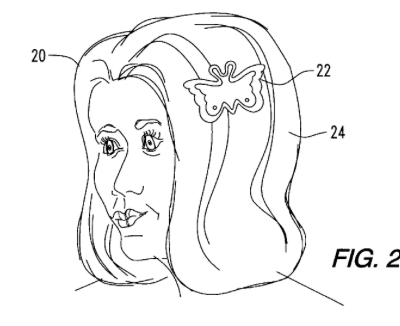 The patent is about a flatiron fitted with shaped crimpers. Any flatiron would work. substrate may be made from fabric, parchment paper, other heat-resistant paper, etc. A transfer substrate was prepared from commercially available bakeware liners (TEFLON®). These substrate bakeware liners comprise a fiberglass substrate bonded to exterior layers of polytetrafluoroethylene. The TEFLON® substrate was cut into rectangular shapes which were 4.5"×2.0". I Have not tried it as an embroidery transfer but think it has a high probability of working well.